We recently visited Boonville, CA, a small bend in the road (rte 128), on the way to Mendocino. 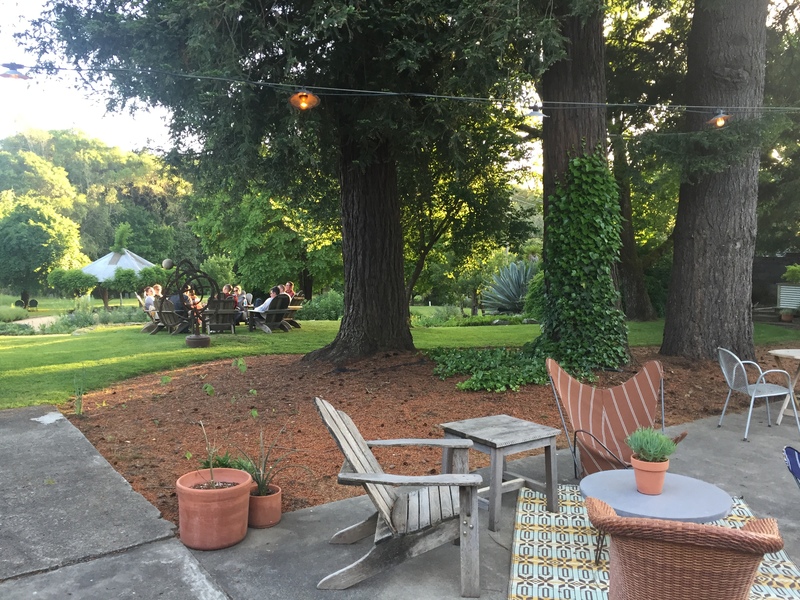 We enjoyed a delicious meal at the Boonville Hotel, actually a top level hotel and restaurant that serves fresh farm-to-table selections; many items, such as the peas, right from their beautiful on-property gardens. I was especially knocked out by this salad combination so I tried to recreate it on my own to share with you. I added avocado (which is a “good fat” along with the olive oil), plus sliced almonds. 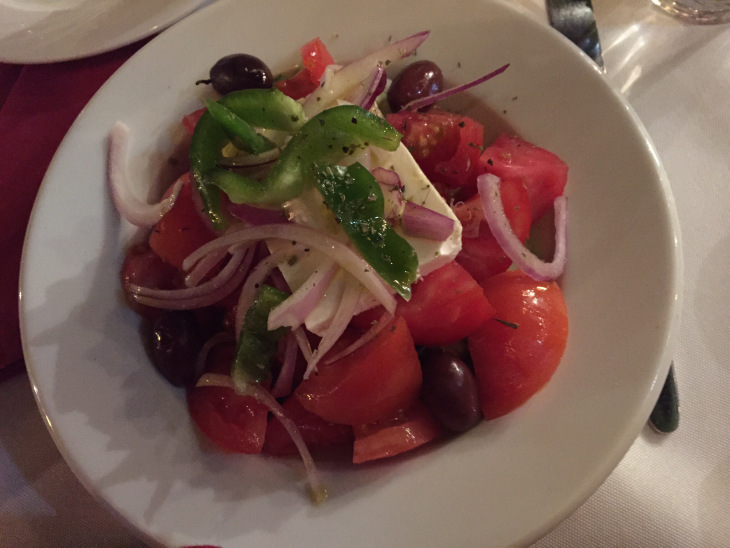 Served with a tangy, lemony olive oil dressing, this salad is refreshing and delicious. One important thing is that the peas need to be fresh, young and tender. (I made a mistake the first time I made it and used older peas. The peas, especially the pods, were tough- no good!) If you can’t use fresh, young English peas, use snap or sugar peas instead. 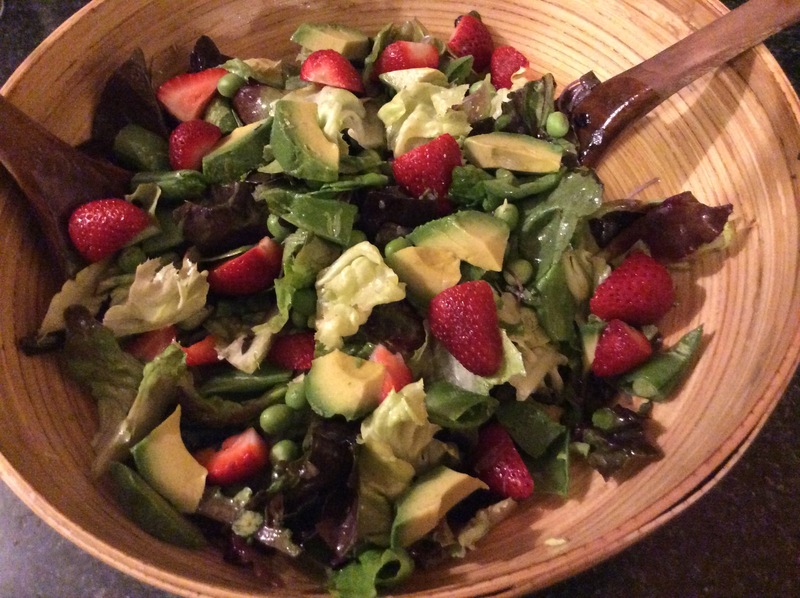 So good, so easy, so pretty and with very fresh peas and sweet strawberries– one of the best salad combos I’ve ever tasted! fresh Thyme leaves (about a Tbsp. ); they are very easy to grow in a pot or in the garden; I use Thyme in many recipes besides salads, such as eggs, roast meats, tomato sauces, etc. 5. Add seasonings and salt if you like. 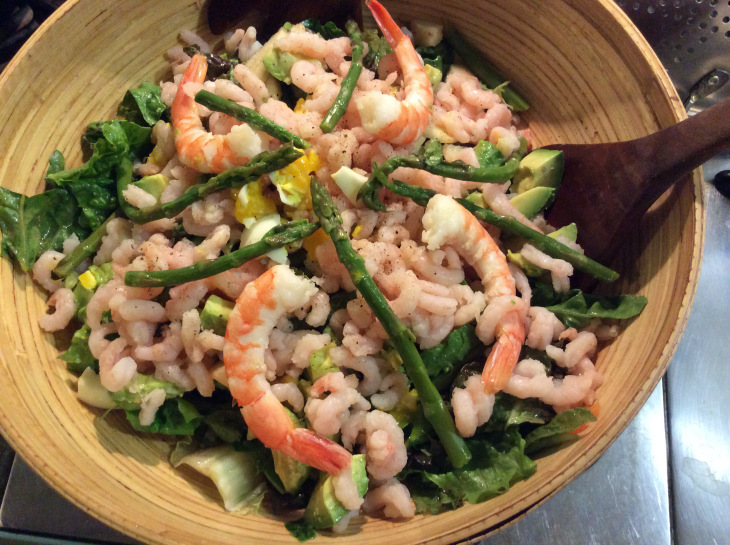 This salad is a major treat especially on a warm spring day when asparagus are in peak season! The ingredients are simple and the preparation pretty easy. The key ingredient is use the freshest you can find! 1/2 lb. Green asparagus, cooked but still crisp, and cooled ( blanched is best– cook until crisp, then dunk right away in ice water to keep the color and crispness). 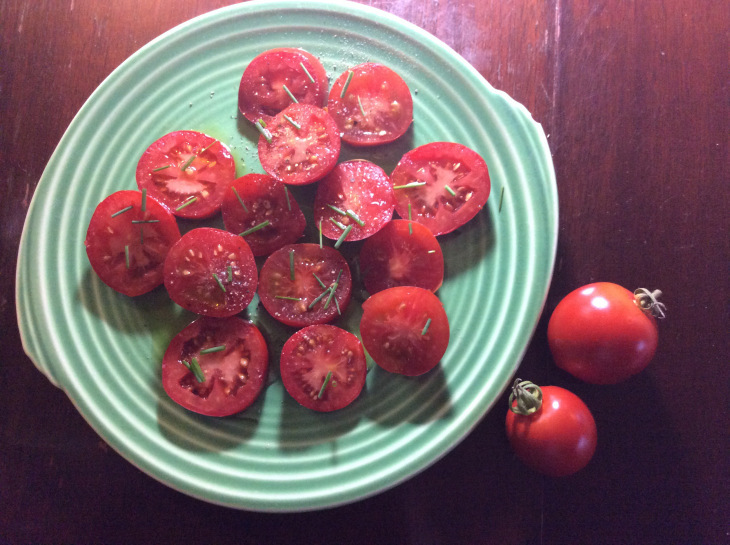 Chop into 1″ pieces, leaving 4-6 spears whole for garnish. 2. Wash, spin and tear lettuce into bite sized pieces, put into serving bowl. 4. Right before serving add Bay shrimp, chopped asparagus, chopped egg and chopped onion to lettuce. 6. 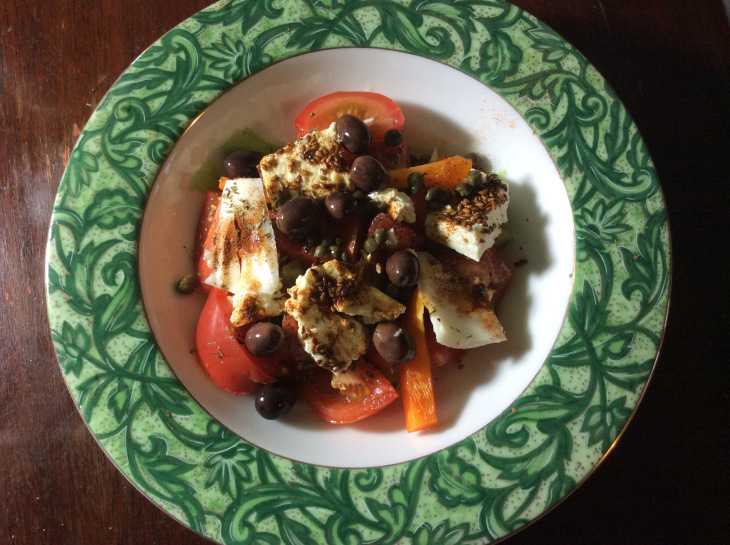 Serve with whole grain toast or crackers and cheese and a crisp, white wine if you like–we do! 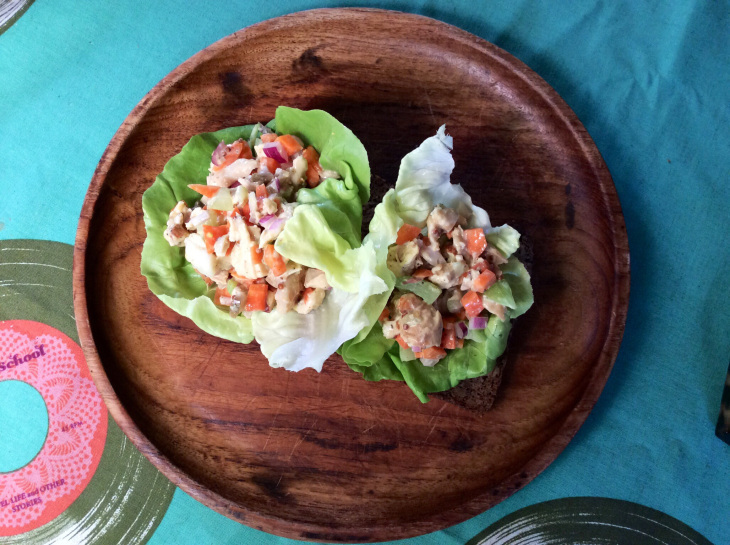 Chicken salad on our old wooden plates! As I’ve said before, use the amounts you like, but these proportions work well. Combine all ingredients into a bowl, and mix well. Serve on lettuce leaves and/or whole grain toast; depending on your carb situation. 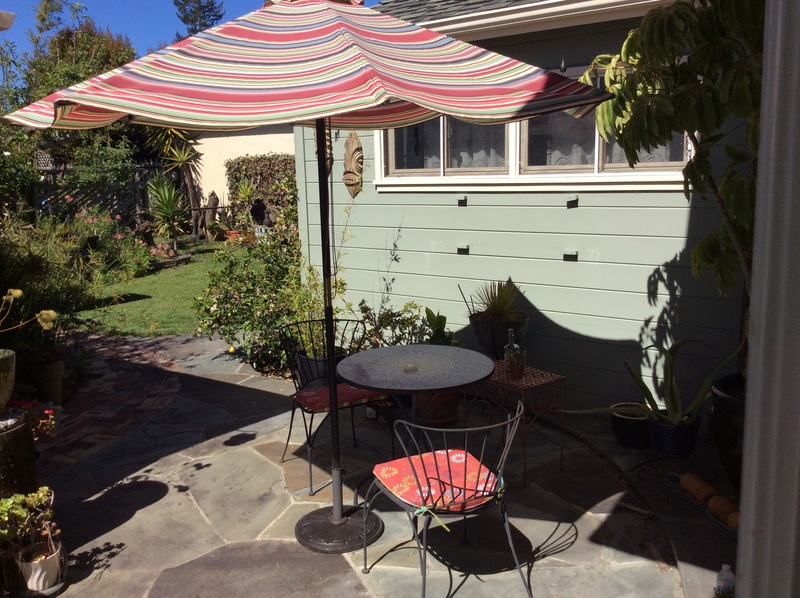 We really like eating our lunch al fresco under the apple tree in the back yard.